More than 500 people participated in UNCOM’s sixth annual Walk for Wellness, which took place on a course designed to highlight parks and a community garden in the neighborhood near the Silver Spring Neighborhood Center, 5460 N. 64th St.
United Neighborhood Centers of Milwaukee (UNCOM) created the walk to promote the benefits of healthy eating and active living. Every year the event is hosted by one of UNCOM’s eight member agencies. The one-mile route featured a KaBOOM playground built last year in Westlawn, as well as a new community garden and playground area in Westlawn Gardens, at 5555 N. 62nd St. on the east side of the Westlawn housing development. The Housing Authority of the City of Milwaukee provided funding last year to create the 30,000-square-foot garden. Westlawn residents and other area families can rent a plot for $10 a year. Anthony McHenry, interim executive director of the Silver Spring Neighborhood Center, said that the garden had a late start this year, but awareness about it is spreading. The walk also promoted a program called 5 4 3 2 1 Go. The numerals stand for five servings of produce, four servings of water, three servings of dairy, two hours or less of screen time and at least an hour of physical activity. “5-4-3-2-1 is like an acronym. It is easy for children to remember, but it is something that we think universally promotes healthy habits in adults and families,” O’Connor said. The message was developed by the Chicago-based Consortium to Lower Obesity in Chicago Children. 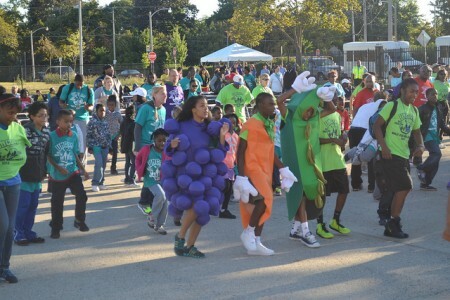 The Zilber Neighborhood Initiative (ZNI) funds the annual walk, which included a healthy bagged dinner and entertainment by the Figureheads, a Milwaukee band, and the Mind, Body and Soul Dancers. UNCOM is the lead agency for the Milwaukee Childhood Obesity Prevention Project (MCOPP).